I am so excited! Ready to embark on my first real offshore cruise, it´s just a couple of hours until casting off: Aboard a Pogo 40 S, it´s four days of heavy weather-training roaming the German Bight I´m looking forward to. Starting in in northern German port of Bremerhaven we are going to round the Island of Helgoland to make landfall again after some 250 miles of high speed-sailing in Cuxhaven at the estuary of River Elbe. Having completed my basic sailing training last week (which can be read here and here) all my experiences, learnings and skills are still fresh and motivation high as ever to see my skills transferred onto a bigger yacht. Being aboard a French built thoroughbred racing yacht immediately … so much the better. Even more, my cruise is not just an amusement getaway but planned as a heavy weather training. So the forecasts promise winds of up to 26 knots which could reach a steady Beaufort 6 with gusts even stronger. Looking forward to not just having fun and learning it will be a test for my clothing as well. But which sailing cloth to choose and how best to prepare for the coming weather? When I first bought all the clothing stuff it was the jacket that naturally came to mind as the first item to buy. 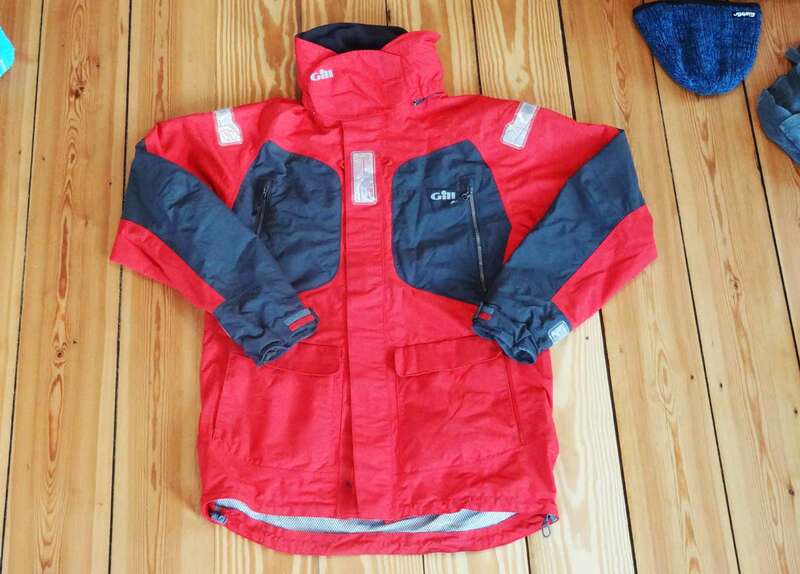 Which is a matter of course since this piece of clothing alongside trousers and boots will define most of the comfort when outside in the wet and mostly windy, cold elements. A coat for sailors is called “oilskin” and you should opt for a high quality product made by a brand specialized in making sailor´s clothes. Why? Because all the “amateur” outdoor stuff won´t do the job when things get rough, no matter how well advertised. I chose the brand Gill because I think it´s a brand with a thorough sailing-history and quite a chunk of good ratings in shops and forums. 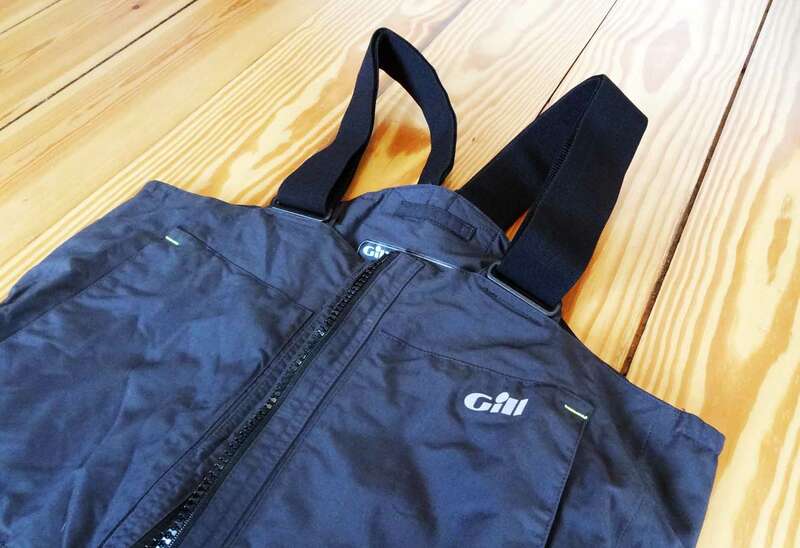 The Gill OC Racer Sailor´s Jacket. When stumbling into the store I was lucky to have a very experienced shopping counsellor because you can´t buy an oilskin like an ordinary piece of clothing. Finding the right size s essential – I´m a very slim and tall person (Size S) with extra-long arms (normally Size L) so I was relieved to have somebody finding the right product for me. My Gill OC Racer Jacket is the oilskin of choice: The fit is just perfect and this jacket features some amazing functions essential when underway. I can stow away a lot of things in multiple bags easily reachable and with – very important! – easy-to-open and close zips. Double waterproof Sealing is a Plus. The jacket is made of waterproof denim (beware of special washing- and drying-instructions! – and basically two layers which are intersected by a layer of air that will provide for fresh air and a thorough venting. 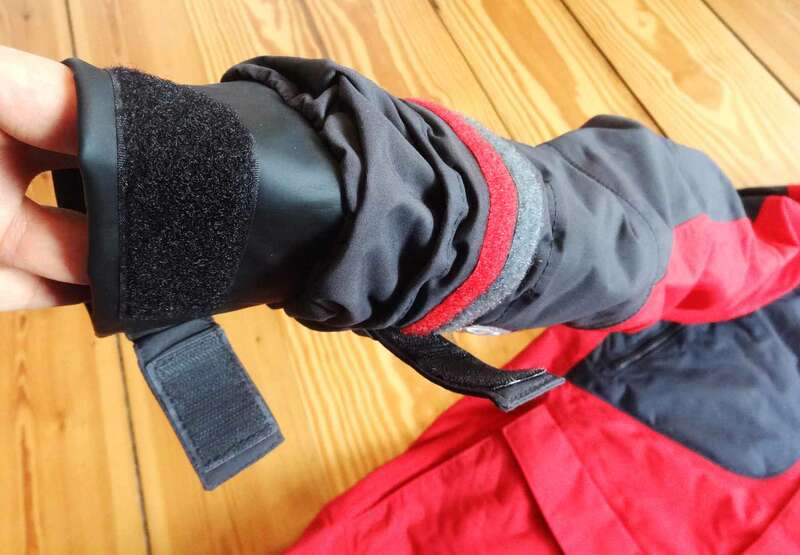 The ends of the sleeves can be sealed off by two barriers – one some 4 inches over the wrist and another one right at the end of the sleeve providing sufficient protection against water pouring in via the gloves. It features a high yoke, covering half of my head when closed and a big, nicely adjustable hood. The jacket is big enough to fell cozy in it yet nicely fitting and not hindering my movements. This all comes with a price tag: A Gill OC Racer will cost some 400 to 600 Euros, but judging from my (sparse) know-how it´s well worth that money. 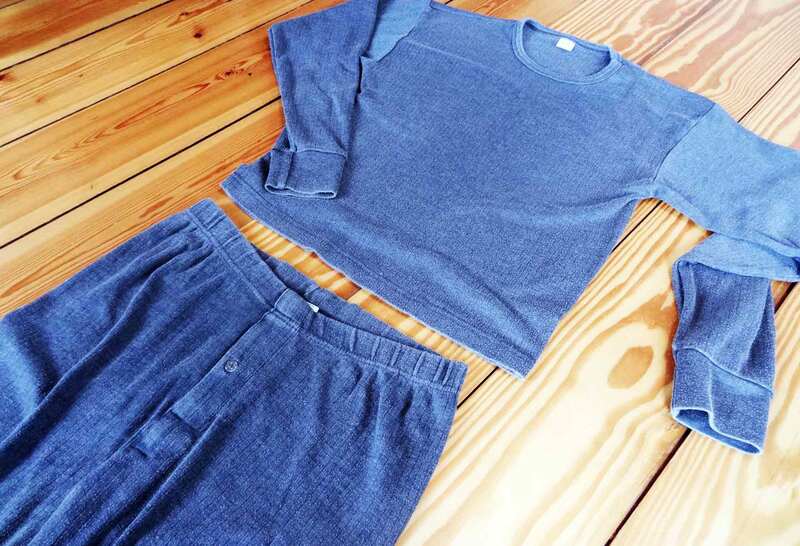 The good ol´ Long Johns: Not very stylish but doing their job well. I was wondering if I´d buy a wetsuit but opted against it. Not because I wouldn´t find that piece of clothing useful – which I really do – but because my financial limits are reached this month. I know of quite a handful of skippers who recommend having a wetsuit when sailing during the colder months because it won´t just keep you warm and dry but in case of emergency – MOB – it really raises the chances of survival and will protract hypothermia effectively. So with the baselayer you basically ensure the right temperature, mid- and external layers will ensure you stay dry and protected against the elements. Make sure a thorough ventilation is provided since your own body-heat and sweat could easily create a very inhabitable micro-climate underneath the clothing which can really be annoying. Speaking of waterproofing, it´s the trousers which play an almost equally important role as the jacket itself. When talking of “oilskin”, we usually refer to jacket and trousers. Trousers on a sailing yacht – especially in rough weather – do have more tasks to fulfill than just being waterproof. Again, having some bigger bags available is essential for having stowed useful stuff, glasses, provisions, tools and gloves. These bags should be reached, opened and closed easily and should be waterproof and –tight too. A trousers for sailing should have a very tight and loose fit at once: Which means, getting them on and off should be a matter of seconds, so wider pant legs are of importance. Sailing trousers should always feature strong, adjustable and yet comfortable suspenders because you won´t be pleased to fiddle with a belt. Apart from that, the upper part of the trousers should end well above your belly button, letting water no chance at all to pour in. Gill OC Racer Trousers: Best Choice. I opted for Gill as well, because these trousers did provide all the stuff I found useful. Apart from that, when exercising and balancing on the foredeck to haul in the Genoa to have the storm jib hoisted you will be working in heavy seas on your knees: The material should be abrasion-safe and sturdy enough to withstand the strains put on the knee-areas. Make sure your sailing trousers are actually made for sailing, being waterproof alone isn´t enough here. 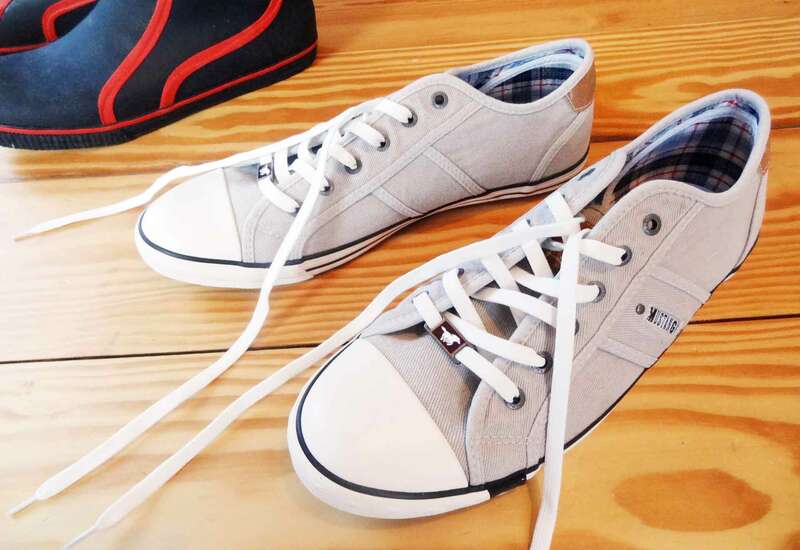 Pant legs should also feature mechanisms to seal off trousers and prevent water from intrusion from boot-side. 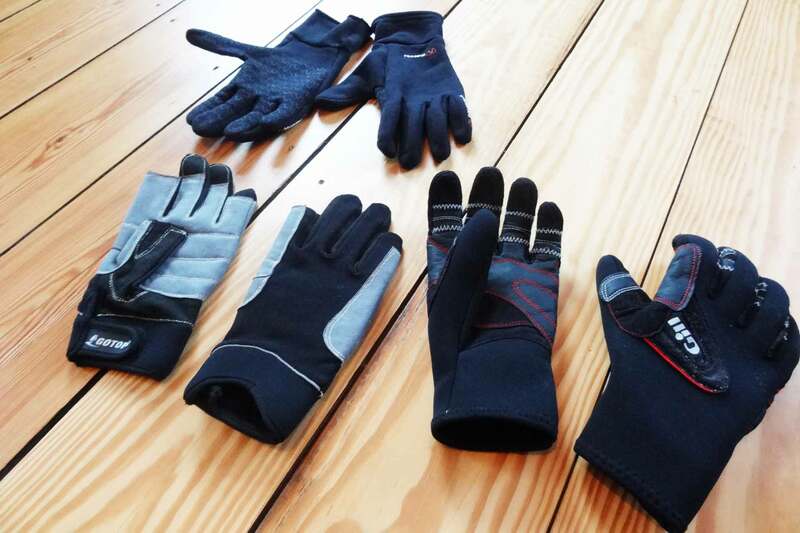 Returning to the baselayer, it was no option to buy a wetsuit so that I will test out two kinds of baselayer-cloth: The good old Long Johns of my youth. Having found them in the lowermost rack of my closet I fear these are the only remainder of the very clothing I did feature when doing my A-Levels some 20 years ago. Nevertheless, having lived in sometimes very cold Eastern Germany they proved to dispensing warmth and holding body heat effectively. Made out of wool makes them appear perfect temperature-wise. I guess it could be interesting to test special made baselayer-cloth made out of high-tech materials since I know of the wonders of modern day special-clothing from my times when doing bike racing but that´s something for the coming cruises. Something I am really fond of is the One-Zee. That´s a leisure suit that is just made to be one piece. You simple jump into the suit, close the zipper and that´s it. One-Zees ca be bought in different thick qualities ranging from leisure loose-fit to a very warm and cozy Long John-Substitute. I will take one of these with me. The good point at it: When having finished my watch at the helm I can get rid of the oilskin and remain dressed in One-Zee jumpsuit under deck. 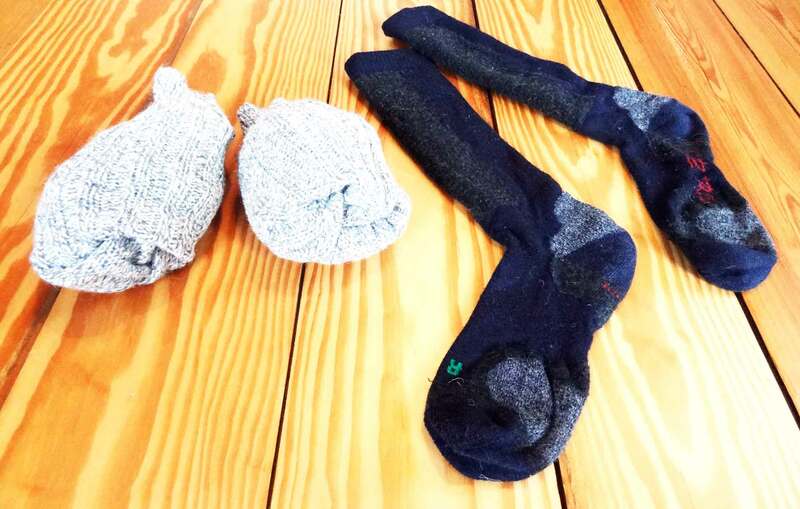 Thick Woolen Socks vs. High Tech Sailor´s Socks. Socks. Well, that´s quite a topic. Again I can revert to my large experience as bicycle racer where technical clothing – and socks being a top-priority – has been of utmost importance. Riding a 350 km-bike race in hot summer through the French Alps would have blown off your feet if it was not for special socks to discharge some of the heat and sweat from them. I did buy special made sailing socks with reinforced areas at the shinbone front and toes and thinner areas for venting at the sides. Even “L” for left and “R” for right in red and green has been stitched. But you know what? I really think the classic woolen socks will perfectly do as well. Which will be a difference from some 25 Euros for the high-tech skipper-socks to 6.99 Euros for two pairs of 100% woolen socks. I look forward to judge their performance after the trip. You know what? Since I´m 17 years of age I do have a skin head. It´s a convenient, cheap yet beautiful way to have a hairdo. I love to have my head shaved every second week or so, it´s a matter of 5 minutes and it doesn´t cost a Penny. Very convenient and – from what I´ve heard – the girls love it. But honestly: It´s a bad haircut for sailing, because it´s damn freaky cold. Humans lose more than 30% of body-heat via their heads so protecting it is essential. On the other hand: Feeling the wind on the bare skin helps (me) a lot to quickly determine from where it´s blowing. Quick sail trim at any time. 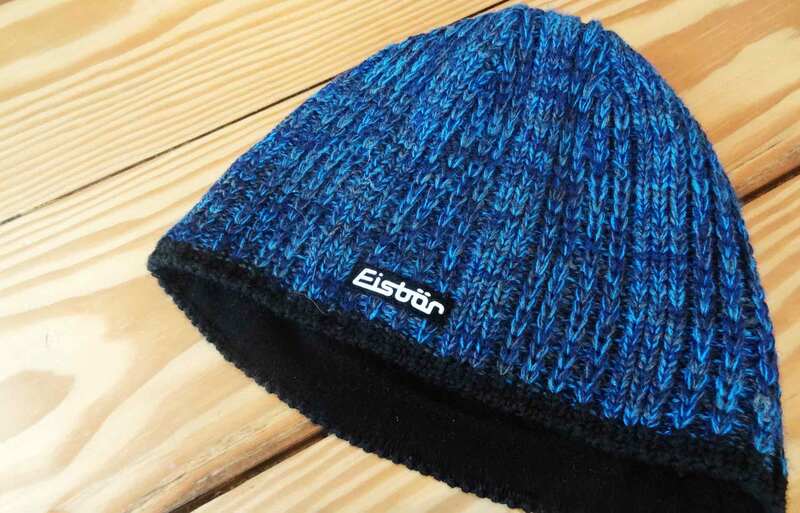 Woolen stitched Headgear – keeps warm ,but not dry. By Eisbär of Austria. So, to have my head protected against the cold and water spray but at the same time keeping my ability to feel the wind on my skin I opted not to seal off my head completely by employing a neoprene-made special skipper-headgear but to have a skiing-hat made of wool again (like the socks). This will enable me to stay warm on the one hand and yet feel some of the wind since the woolen stitches will let through some air too. Of course, my Eisbär-hat is not waterproof so that could be a source of trouble. I´m not only a skin head but a spectacle wearer as well. My specs are holy because with more than 4.5 Diopters I am a little better than virtually blind if I´d lose the specs due to a gusty blow or a wave knocking them off my nose. Securing the specs with a strap at least should be of no question. Better would be to have another strap to attach the specs to the yoke of the jacket as well. 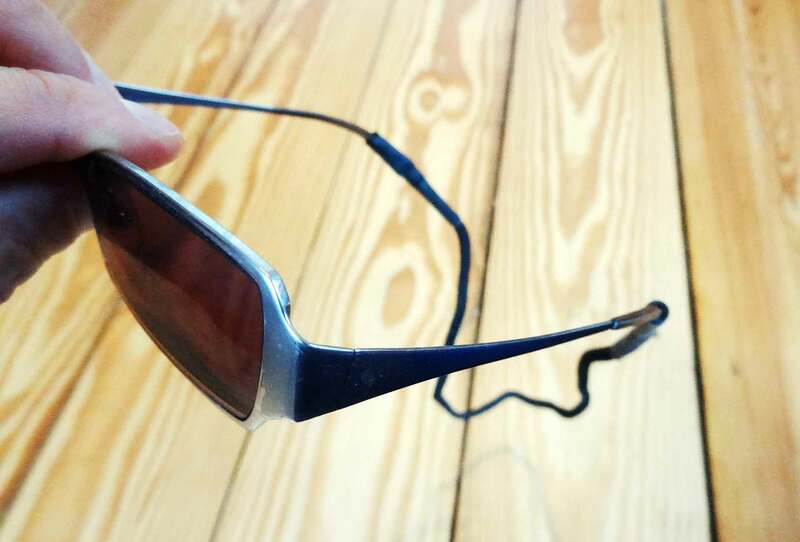 A Safety Clip for Specs will save your Glasses from blown being away. Honeywell Safety Specs will provide for perfect cover against Water & Waves: Even for People with Specs. 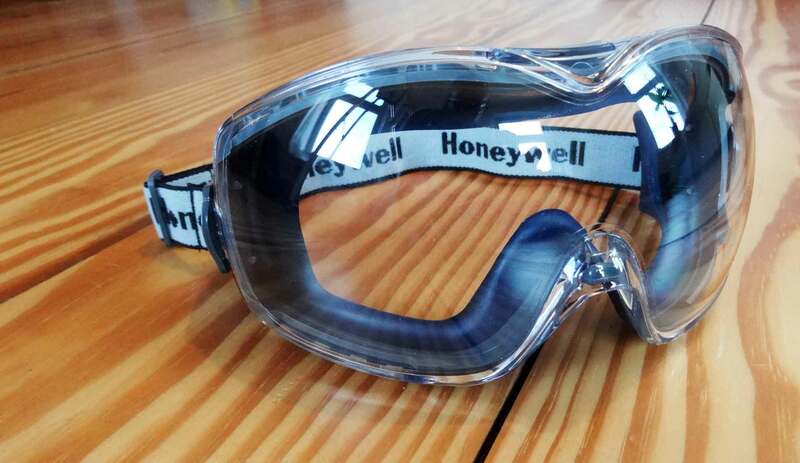 When it comes to real nasty weather, I´ve prepared a special precaution: This safety specs is made by Honeywell, originally made for eye protection when doing crafting stuff whilst building houses or employing grinders and saws, it´s just a perfect thing for sailing: It will cover my normal specs and seal my eyes off all kinds of water spray. The glass is crystal clear so I can even employ these glasses for stormy night watches. Last but not least – the boots. Remember: DO NOT WEAR STREET SHOES ON BOARD! That´s an iron law. Six people wearing their ordinary shoes can transport a lot of dirt and dust to the boat which simply is disrespectful and annoying, it also can cause harm to the wooden decking as well. So as I am a big fan of Converse Chucks-style shoes I bought an extra pair of Mustang-“Chucks” to be exclusively worn aboard ships. Most important thing about sailing shoes: White soles! Why´s that? Because when scraping or rubbing on wood dark and black soles can leave nasty scrub marks which are laborious to impossible to be removed. This is when weather is fine. When it gets rough, having special boots is choiceless. Boarding with nice white Shoes: I prefer Mustang over Chucks. You may go and buy ordinary rubber boots and I know some skippers who like them. I bought, you guess it, a pair of Gill boots because I would think the soles are specially designed to provide for grip on deck and wet surface and it feels like the inner coating or insulation of the boots are able to provide for at least some warmth. I did employ these boots during my sailing courses during the last two weekends and I can say they worked very well: Warm, dry and easy to put on and off. So, having packed up my rucksack and added not less than three pairs of gloves (2 sailing gloves, one pair of warm, long bike-gloves), some underwear, T-Shirts, toothbrush & -paste and – very important – earplugs in case a snorer will occupy the bunk next to me, I feel ready and well prepared. In the end, you may be able to easily spend 1.500 to 2.500 Euros in a pro-skipper set of clothing but I would think that´s a bit over the top. I did not save money on the external layer: Oilskin and boots did come in at a little more than 800 Euros. I guess (and hope) ordinary, warm clothing for base- and midlayers will at least do their job. I will certainly report after my cruise if I was right. Or wrong. For now I am just excited: boarding the Pogo 40 tomorrow and having a fun and fast trip sailing around Helgoland. Previous Post	Tack – Gybe – Tack – Gybe – Tack – Gybe … Man Over Board! Next Post	Sailing a Pogo 40 to Helgoland.